There was an unusually strong response to my last post on the Gopher-based software repository at gopher://i-logout.cz. 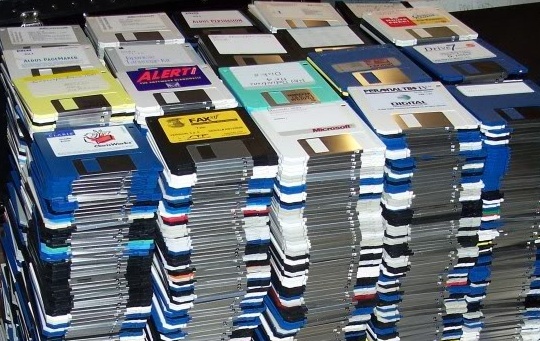 I don’t know if this was simply a reflection of interest in new sources of vintage Mac software, or perhaps was an expression of latent longing for the long past glory days of Gopher, or perhaps something else entirely. No matter what it was though, I thought I would follow up my last post with a little more information on Gopher. I have spent some time digging into native Gopher clients for Mac OS, Mac OS X, and even some of the older Windows platforms. This was a fruitful exercise and turned up a rich set of available Gopher clients, all of which continue to work well today. Unlike the underpinnings of today’s web, the Gopher protocol has remained largely unchanged, and that means that unlike yesterday’s long-in-the-tooth web browsers, the Gopher clients of days gone by continue to work well today (are all Gopher clients long-in-the-tooth by definition? 🙂 ). > Mac OS 7.x and forward. 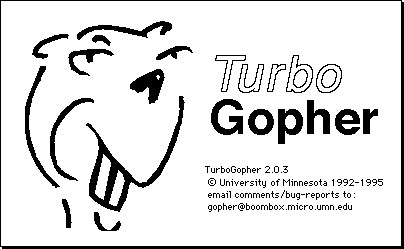 TurboGopher was (and remains) the golden standard. I installed TurboGopher and used it to surf gopherspace, and I can report that it works very well (more on that below). Honorable mention goes to NetScape Navigator 4.7, which supports the Gopher protocol natively. Finally, today’s Classilla 9.3.2 supports the Gopher protocol natively as well. > Mac OS X Tiger. Clearly TurboGopher and NetScape can be used in Classic mode, and this may be the best option. Native Gopher support in Mac OS X 10.4 seems limited to the weirdly unusual Gopher VR, a title that defeated my best efforts to install it and run it successfully. Thankfully, per my earlier post on the i-logout.cz software repository, the OverBiteFF plugin for Firefox, which works very well with TenFourFox, imparts Gopher capability to that fine browser, yielding usable Gopher support via that avenue. Finally, I stumbled across a “new” old browser for Mac OS X 10.4 that also supports the Gopher protocol natively: OmniWeb. OmniWeb will be the topic of a separate post – I am SO impressed with it. > Windows 9x (Windows 95, 98 and ME). I would guess that few readers of this blog will be all that interested in Windows 9x Gopher support, but since I also have a healthy collection of vintage PCs, I thought I would throw this in for completeness. WSGopher32 was the Windows 9x PC equivalent of the Mac’s TurboGopher. It was THE golden standard. There were lots of other Gopher clients for the vintage PC world, but I will not elaborate on them here. Check out the Offbeat-Internet page above. You will find several listed there. I will however elaborate just a little bit more on TurboGopher, which I tested under Mac OS 9.1 on my Power Macintosh 7300/200. As you might expect with a name like “TurboGopher”, this program is fast. It launches quickly and pages load smoothly and easily. The program features a very nice Finder-like interface, with each new page opening in a new window, neatly resolving the “how do I go back to the previous page” question that haunted several of the other Gopher clients I tried out. Gopher is 100% text based, and any Gopher hole author who is feeling even the slightest bit creative quickly starts adding ASCII art to their pages to give them some visual interest. 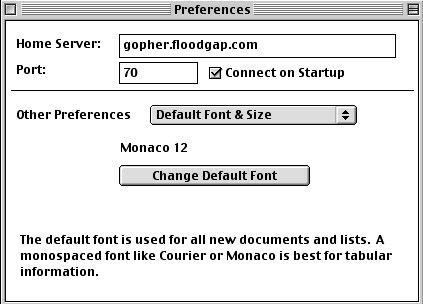 Because of this, it is VERY important to set TurboGopher’s preferences such that it uses a fixed width font. ASCII art does not look like art at all, nor like much of anything else really, when viewed with the default proportional font that TurboGopher starts up with. Fix this by going to TurboGopher’s preferences and setting the default font to a fixed width one. I chose Monaco 12, as you can see below. So, what do Gopher pages look like when viewed through a “best-in-class” Gopher client? Below I show two Gopher pages as rendered by TurboGopher. The first is the i-logout.cz page mentioned in my previous post, and the second is the current reigning home page of all gopherspace, gopher.floodgap.com. 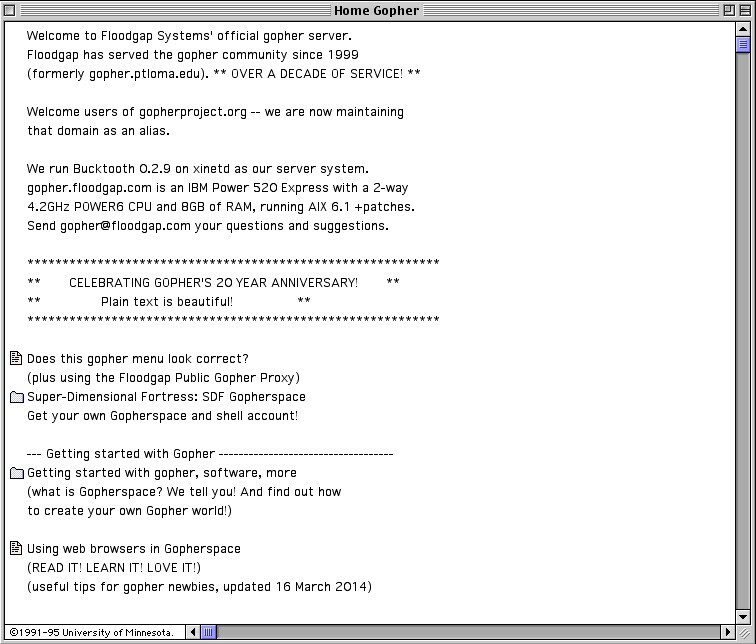 So that’s it – The world of Gopher is alive and well and you can be part of it. 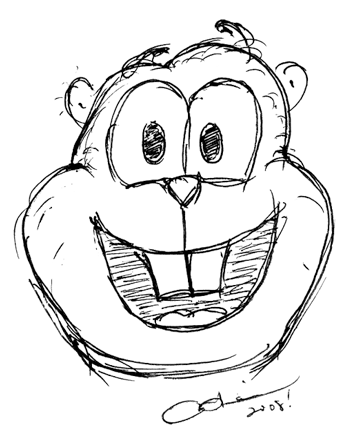 Just download one of the Gopher clients from the Offbeat-Internet repository, sharpen your two front teeth and head off into gopherspace!